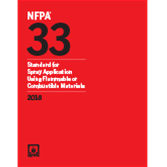 Address fire and electrical safety concerns more effectively with the 2018 edition of NFPA 33: Standard for Spray Application Using Flammable or Combustible Materials. Protect workers by addressing fire, explosion, and electrical hazards in industries that spray flammable and combustible liquids, including waterborne materials that contain flammable or combustible residues. The 2018 edition of NFPA 33 has the latest rules for the construction of spray rooms, spray booths, and spray areas, along with their electrical installations, ventilation, and fire protection systems; and for safe spray application of coatings, including handling of flammable liquids, operations, and maintenance. NFPA 33 requirements address automated and hand-held spray application processes, as well as specific requirements for electrostatic and powder coating spray systems. The Standard also includes specific requirements for hand lay-up and spraying operations for glass fiber-reinforced plastics. Major changes improve consistency and clarify requirements, making this edition essential for engineers, designers, contractors, and installers. Chapter 1, Administration clarifies document application. For example, Chapter 14 shall apply only to miscellaneous spray operations, and Chapter 18 shall apply only to spray application processes or operations that are conducted in temporary membrane enclosures both inside and outside buildings and structures. Modified Chapter 3: Definitions is parallel with other NFPA® documents placing noncombustible material, limited-combustible material, and classification of liquids and determination of flash points in a General Requirements section. Changes are consistent with NFPA 1: Fire Code, NFPA 30: Flammable and Combustible Liquids Code, and NFPA 5000®: Building Construction and Safety Code®. Updated Chapter 4: General Requirements is applicable to all spray operations. Changes clarify definitions and spraying location, making them consistent with Chapter 5 requirements. Changes in Chapter 5: Construction and Design of Spray Areas, Spray Rooms, and Spray Booths address the confusion between spray rooms and spray booths by providing requirements for each type of spray location. Revised Chapter 6: Electrical and Other Sources of Ignition clarifies movement power vehicles in spray areas. Revised figures improve consistency and clarify electrical classification requirements. Updates in Chapter 7: Ventilation clarify heating of recirculated air and the manifolding of exhaust ducts. Interested in other editions of NFPA 33? Use the drop down menu above to select the edition year you need. 4.1 General Location of Spray Application Operations. 4.7 Determination of Flash Point. 5.1 Walls and CeilingsSpray Areas. 5.5 Separation from Other Operations. 5.6 Illumination and Observation Panels. 6.4 Electrical Devices in Spray Areas. 6.5 Electrical Devices in Areas Adjacent to or Connected to Spray Areas. 6.10 Movement of Powered Vehicles. 7.4 Routing of Exhaust Ducts. 7.6 Heating of Recirculated Air. 7.7 Manifolding of Exhaust Ducts. 7.9 Support of Exhaust Ducts. 7.10 Exhaust Duct Access Openings. 7.11 Exhaust Fans and Drives. 8.2 Storage in Process Areas. 8.4 Distribution Systems — Piping. 8.5 Distribution Systems — General. 9.3 Coating Material Delivery Systems. 9.5 ContinuousAutomated Spray Application Operations. 9.7 Automatic Carbon Dioxide, Dry Chemical, and Clean Agent Systems. 9.9 Protection for Automated Liquid Electrostatic Spray Application Equipment. 9.10 Protection for Dry Particulate Scrubber. 9.11 Protection for Electrostatic Precipitator Scrubber. 9.12 Protection for High-Capacity Dry Paint Arrestor. 10.8 Solvent Distillation Units (Solvent Recyclers). 11.5 Listing and Approval of Equipment. 13.2 Spray Booths and Spray Rooms Used for Ambient Air Drying. 13.3 Spray Booths and Spray Rooms Used for Drying at Elevated Temperatures. 13.5 Spray Booths or Spray Rooms Adjacent to or Connected to Rooms or Equipment Used for Drying, Curing, or Fusing. 14.1 Vehicle Undercoating and Body Lining. 15.7 Electrical and Other Sources of Ignition. 15.8 Ventilation, Dust Collection, and Explosion Protection. 15.9 Drying, Curing, and Fusing Equipment. 15.11 Automated Electrostatic Powder Spraying Equipment. 15.12 Handheld Electrostatic Powder Spraying Equipment. 15.16 Powder Coating Delivery and Circulation. 15.17 Powder Unloading, Bag Dumping Stations, and Pneumatic Conveying Systems. 15.18 Screening or Sieving Operations. 16.4 Storage of Organic Peroxides. 16.5 Handling of Organic Peroxides. 16.6 Mixing of Organic Peroxides with Promoters. 16.9 Material Safety Data Sheets. 17.5 Electrical and Other Hazards. 18.5 Operations and Maintenance within TemporaryMembrane Enclosures. 18.6 Electrical and Other Sources of Ignition. 18.9 Storage and Handling of Flammable and Combustible Liquids. Reduce fire and explosion hazards for workers with the 2016 NFPA 33: Standard for Spray Application Using Flammable or Combustible Materials. Protect workers by addressing fire, explosion, and electrical hazards in industries that spray flammable and combustible liquids, including waterborne materials that contain flammable or combustible residues. NFPA 33 has the latest rules for the construction of spray rooms, spray booths, and spray areas, along with their electrical installations, ventilation, and fire protection systems; and for safe spray application of coatings, including handling of flammable liquids, operations, and maintenance. NFPA 33 requirements address automated and hand-held spray application processes, as well as specific requirements for electrostatic and powder coating spray systems. The Standard also includes specific requirements for hand lay-up and spraying operations for glass fiber-reinforced plastics. The 2016 NFPA 33 helps engineers, designers, contractors, and installers address fire and electrical safety concerns more effectively. Protections for new scrubber technologies help companies protect their workers and pass safety inspections. Terminology correlates with NFPA 70®: National Electrical Code® (NEC®). Other text changes impact electrical classifications for outside automatic spray operations, and additional graphics help you understand electrical classification requirements. A first-time chapter on Spray Application in Membrane Enclosures provides a flexible new means for compliance. The enclosures can be used indoors and outdoors to enclose workpieces that do not fit in traditional spray booths. The term "secondary filter" is now "recirculation filter" and has been clarified to define this type of filter and indicate when it is allowed. Combustible dust fire protection requirements and rules for sprinklers in ducts have been clarified to help users improve fire protection. Annex material provides new guidance in determining the water supply requirement for all sprinklers likely to open in a single fire incident. Minimum Explosive Concentrations (MECs) for representative powder coatings have been validated with recent test data, and updated Annex C contains metallic coating MECs.